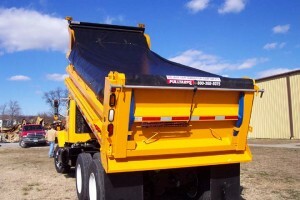 American made Semi-Automatic Pulltarp® Truck Tarp Systems are the original spring return tarping system. Semi Automatic PulltarpThese tarp systems operate by manually pulling the tarp out over the load with a pull rope. The tarp is then rolled back into the housing using spring tension within the roller mechanism. Semi-Automatic Pulltarp® Systems are fully upgradeable to electric drive, manual arms, or automatic arms. These truck tarp systems are great for all applications and are the most economical solution to your tarping needs! And tarping your empty trucks can save fuel, that’s important for a single truck or a truck fleet. We all benefit with better fuel economy from tarping commercial trucks.